Last year on May 1st I released a documentary that would go on to shake the world. I knew it would reach a lot of people, but I had no idea just how big it was going to be until it launched. It received over 10,000 views in the first 24 hours and then averaged about 10,000 views per day for the first week. In the first three months this official youtube upload of Hellstorm racked up around 100,000 views per month. Then it was banned worldwide for a copyright claim, which was successfully contested, yet this version still remains unavailable. This is quite incredible for a film that had less than $4,000 for a production and marketing budget! Our enemies could only wish to get such results with so little spent, but their tired old narratives will continue to flounder, since people have been inundated with Allied propaganda for the past 70 years and do not feel compelled to spread this narrative far and wide, even if they still believe it. On the other hand, Hellstorm is right in line with the truth-seeking zeitgeist of our age, as people are beginning to realize that almost every narrative spoon-fed to us by the jewish media is the inverse of reality. Once folks understand they have been lied to in a big way, and realize the terrible situation we are in today is actually a result of the victory over Germany in WW2, then they feel compelled to shout the truth about Hellstorm from the rooftops. Or at least to share it on social media. The success of Hellstorm has our enemies very worried. 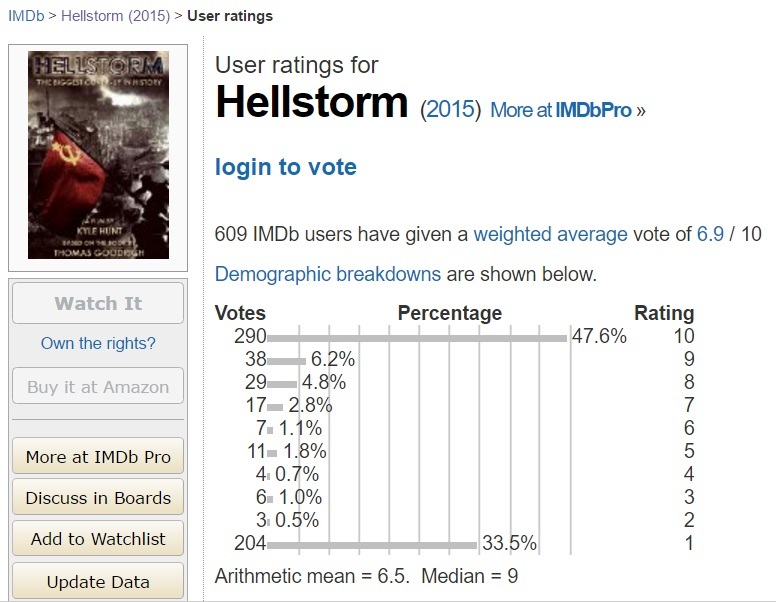 They had a campaign of rating the film as 1-star on IMDb, countering all of the 10-star ratings, to make it seem like WW2 truth is not popular and to discourage others from seeing the film. Unfortunately for them, their campaign to discredit the film has not worked, so they have decided to take their efforts to the next level. In the past few days leading up to the 127th anniversary of Adolf Hitler’s birthday, I received messages that versions of the film on Youtube, including my own and ones on other channels, have been banned around the world (except for the US) because of a bogus copyright claim by BBC Worldwide. Although I wonder how many views the film would have by now if there had been no censorship of my main upload a few month after the release, I think that the efforts to stop the viral success of the film will only backfire. People around the world realize that this truth is verboten and will find ways to get around censorship.